So I'm sitting on my couch, eating Oreos dunked in a glass of milk that my cat has been sipping out of in between bouts of running around like he's on fire (which I know for a fact, but we will not discuss that time when the power went out and Jeans caught himself on fire, at least not right now), and I decided to finally write out something that's been on my mind lately. For the last few weeks I've been contemplating this one thing, this one realization about my life and who I am that's been pretty liberating to give a name to. It all started with a skirt. This skirt, to be exact. I put this skirt on with a stained hot pink t-shirt while the white one was in the dryer, and asked Chris how I looked. He gave me the face, the one where I know he thinks I look like a hobo clown or a colorblind bag-lady. I asked him what he didn't like about it, and he told me the skirt was far down on his list of favorites. That's when I realized: I don't actually care. At that moment I recognized that the affect his distaste for my outfit had on me was not instant embarrassment, it didn't result in me running to my closet to throw on something else. I liked my skirt, and I wanted to wear it, so who the heck cares if he likes it or not? Now, I don't mean to say that Chris's opinion doesn't mean anything to me. Of course I want him to like the way I look and dress. It was more of an 'a-ha' moment where I learned that I have decided to not let other people's opinions of me determine the direction of my life. I know this skirt story seems like a small drop in this big-pond-kinda-idea, but that moment was when I finalized this truth about myself that I've been working towards my whole life. And it feels freaking awesome. For the majority of my life I was a shape shifter. In high school I had very few friends, and the ones I did manage to get didn't stick around for very long. I was so desperate to fit in that any group of people who would let me into their circle became the determining factor on what my personality du jour would be. I was the weird girl who wore hot pink snakeskin pants once a week in freshman year, I hung out with the Polish guys who were really into cars sophomore year. Junior year I hung out with the punk rock crowd for a little while and then had a brief stint as one of the hippie girls (complete with a patchwork dress and Birkenstocks), and senior year I made some friends in the art department and got into indie music. I wasn't terribly un-confident, but it was enough for me to let the people I surrounded myself with determine what kind of person I was, at least on the outside. It was pretty much the same thing in college, I wore the stuff that everyone else wore and did the things everyone else did, even though it didn't especially make me happy. This past year I've been making my own choices. It could be because I don't really have time to be influenced by other people, but I think it's mostly because I've found the confidence in myself that I've been lacking for years. It's outwardly apparent in the way I dress, but it's a reflection of a change I've made within myself too. I just don't care! It's not out of rebellion or apathy, it's the happiest "I don't care" out there. I am so assured in who I am now that whether someone else judges me for what I look like or how I act, or the choices I make in my life, none of that matters to me because I am happy. I'm wearing these clothes and doing these things and making these choices because it makes me happy. And in turn, my happiness affects other people. Sure, I have crappy days and get pissed off and yell and cry, but at my core I'm a happy person. I spent a lot of time in my life searching for someone to be like, but now I can be myself. I sound like a cheesy after school special! But really, this is sort of a new thing for me. I know exactly how you feel, I've always been like that and now I'm finally becoming my own person and not just trying to fit in with other people. You always look so pretty! and I agree with Gemma! I know how you feel. I've realized lately how much I've changed since I was in HS of was 18(I'm 22 now) and I really like the changes. The biggest thing is just like you said, I'm more comfortable with who I am, how I dress, my style and looks. I love your skirt and I showed it to my bf and he said it "wasn't too bad" haha. Boys, huh? i recently realized the same thing! just last night even, i was looking at shoes on aldo, and i said i loved this one pair and my husband was just like, "mhmm...."
and then i said, "i don't care if you don't like them." Awwww! I love this post. It's so sweet and honest. I think you always look cute! You have the best style. This was a great post, I really appreciated your honesty. I think that's one of the nice parts of getting older -- you start to become comfortable in your own skin and with who you ARE. It's taken me till I was almost 30 because I was in a bad relationship for most of my early and mid-20s and I was trying to conform to who HE wanted me to be. But since we've separated, I've finally started being ME -- both in personality and in style. I feel like a new woman. Thankfully now I'm engaged to a guy who really appreciates my quirks. This was such a great post!!! I know exactly how you feel. I was kind of the same in high school! Also, I totally had those pink snakeskin pants too! I love that skirt!!! And this post. It was full of honesty and truth. I never wore pink snakeskin pants, but you should post a picture of you in them, if you have one. Because they sound pretty epic. I love what you said here and I too struggled to accept and find my identity for a long time. I still feel like I have things I need to figure out about myself but I think that is an ongoing thing with anyone. In High School I had my own identity (I wore platform heels and a leather jacket to school everyday) to a certain extent but I also was afraid to acknowledge many things about myself that I knew I was interested in, like what could be considered "dorky" things or "dark" things. I almost feel like if anyone knew me during that time period that they really didn't know the real me because I didn't even know who I was yet. I'd say that even extended into my early 20's as well. Now that I'm 26 I'm much more comfortable in accepting myself, although there are days when I just want to escape myself. Anyway, this is a great post and very well written. Thank you so much for sharing! I know posts like this can be hard to write and put out there. Life is too short not to wear clothes we love just because of someone elses opinion! 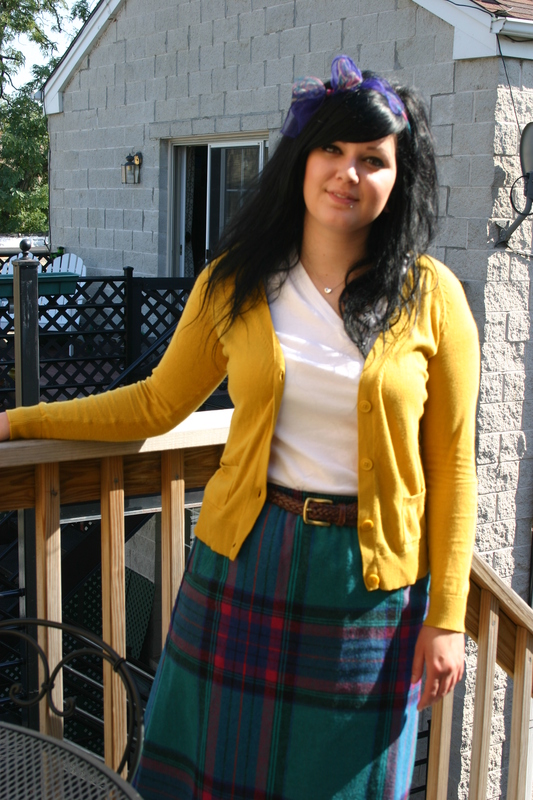 I think this skirt looks darling, especially with the mustard cardigan. Love this post!! Completely how I've been feeling this year too!! :) it's so nice to finally feel like yourself aye and not care what others think!! It takes a long time to finally reach a point where you are who you are and who really cares. Good for you for reaching it at a young age (hey, I'm 30, and I probably didn't hit mine until a year ago). Go you! Go us! I love coming across a post like this wehre you know exactly what someone is talking about. It took me a while to be who I wanted to be but this past year it has finally happened. A big part of it it because I finally left a job that I was not happy with and am now going towards something I love. I have the relationship I wanted, the family I wanted, and the best part is it's all happening because I took the time to (at the risk of sounding corny) find myself and realize what I really wanted.Being self-aware is an awesome feeling. Thanks for this post! New follower here! You are an absoulutly amazing person. I have recently been feeling so.... "I want to look like everyone else" and your post just completely reminds me to be me! It is hard having to have confidence in yourself, when everyone around you has an opinion! Thank you so much for just being honest, and being you. And its nice to know that other girls have confidence issues too. I'm so thankful your so secure in yourself now, because you helped make me feel beautiful! P.S Your also offically my favorite blog!